Today computer networks are everywhere. You will find them in homes, offices, factories, hospitals leisure centres etc. But how are they created? What technologies do they use? In this tutorial you will learn the basic networking technologies, terms and concepts used in all types of networks both wired and wireless, home and office. The network you have at home uses the same networking technologies, protocols and services that are used in large corporate networks and on the Internet. The only real difference between an home network and a large corporate network is the size. A home network will have between 1 and 20 devices and a corporate network will have many thousands. If you are completely new to networking then the basic course will introduce you to the basic networking protocols used in small home/office networks and on the Internet. Setting Up and building a Home Network will introduce some basic networking component and show you how to build a home network and connect it to the Internet. Networks can be wired or wireless with most networks being a mixture of both. Early (pre 2008) networks were predominately wired. Today however most networks will use a mixture of wired and wireless network. Wired networks use Ethernet as the data link protocol. This is unlikely to change with the IOT, as IOT devices will be predominantly wireless. Ethernet ports are found on almost all laptops/PCs and netbooks even on those 8 years old. Wired networks are faster than Wireless. Data rates were periodically increased from the original 10 megabits per second, to 1gigabits per second. Most home networks use 10-100Mbps. Need to Use cable which can be unsightly, difficult to run and expensive. Can’t be used easily between buildings (planning etc). Not supported on Mobile phones and tablets. Generally easier to set up. Can be used with mobile phones and tablets. Generally Slower than wired networks. Not as secure depending on set up. There are many different ways network nodes can be connected together. This isn’t normally a consideration in small networks but has networks get larger it becomes more important. There are many different ways network nodes can be connected together. Common connection technologies like Wi-Fi, Bluetooth etc are designed to work using a particular network topology. When designing networks and choosing connection protocols having an understanding of these topologies is important. Each of these topologies has advantages and disadvantages this Network topologies article has a really good overview of each topology along with advantages and disadvantages. Early Ethernet networks used a bus structure, modern Ethernet networks and Wi-Fi Networks. use a star bus (hybrid) structure. However both Wi-Fi and bluetooth are being upgraded to support mesh networking. How the nodes on a network communicate with each other can be very different to how they are physically interconnected. Most Home and small office networks use a physical bus topology. Common logical typologies are Peer to Peer and Client Server. The web (WWW) is a client server network at the logical level. 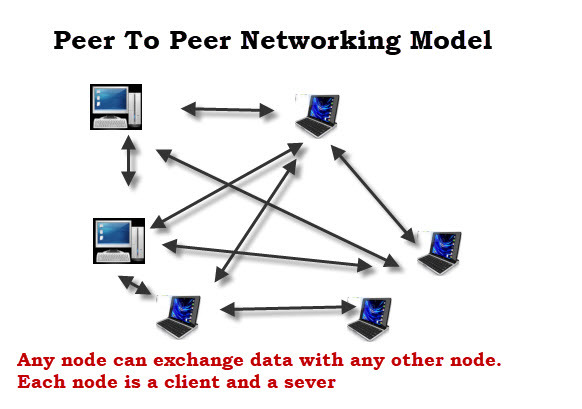 in a peer to peer network all nodes are equal and any node can talk to any other node. More difficult to locate information. A Modern example of Peer to Peer networking is BitTorrent. Although this networking model isn’t currently popular it could become more popular with the Internet of things (IOT). 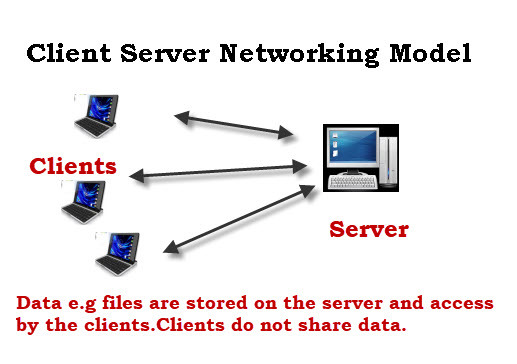 In a Client Server network a server has a special role e.g file server, domain controller, web server etc. A client connects to a server to use the appropriate services. A Modern example of Client Server networking is the Web. Facebook,Twitter,Google search and many other web services use this networking model. WAN – Wide area network – links devices across a country/countries. A protocol defines a set of rules that govern how computers talk to each other. Ethernet and Wi-Fi are Data link protocols that are responsible for framing data on the media (cable or wireless). They can be used for carrying higher level protocols (IP etc)..
Ethernet and Wi-Fi use a physical level address know as the MAC address which is 48 bits. EUI 64 addresses are MAC addresses with 64 bits will replace MAC addresses on IPV6, 6LoWPAN, ZigBee and other new network protocols. See this Wiki for details. You can divide networking into distinct levels or layers. Each level or layer is responsible for a particular function. The OSI uses a 7 layer model and TCP/IP networks use a 4 layer model. Networking e.g. IP, – IPv4 Address classes and subnetting and IPv6 Explained for Beginners. See Understanding the TCP/IP protocol suite and TCP port and sockets for details. Every device attached to a network, and the Internet has an IP address. There are two versions of IP, they are IPv4 and IPv6. IPv4 has been in use since the start of the Internet, and is deployed across the Internet, and home/corporate networks. IPv4 uses 32 bits for addressing, however due to the rapid growth of the Internet, all IPv4 addresses have been allocated (as of 2013). Techniques like NAT (network Address Translation) have extended the life of IPv4 by allowing the use of private IP addresses inside networks. The roll out of IPv6 across the Internet is happening slowly, and IPv4 will be with us for many years to come especially in home and small office networks. As IP6 rolls out they will also be a need to operate with two addresses until migration is complete, and IP4 is discontinued. 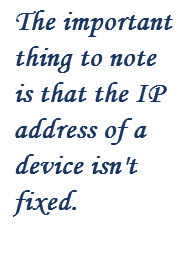 The important thing to note is that the IP address of a device isn’t fixed. Both IPv4 and IPV6 have both public and private address ranges. The private addresses are used for home/business networks and the addresses aren’t routeable on the Internet i.e. they don’t travel across the internet. Public addresses are reachable from anywhere on the internet and are routeable. Most modern networks use automatic IP address assignment via DHCP with manual assignment only being done in special cases. For home networks the Internet router or hub usually provides DHCP services for the network. For larger networks a dedicated DHCP server is normally used. Most windows machines will auto assign their own address if they fail to find a DHCP server. This can cause problems see troubleshooting Internet connections. Computers use numbers (IP addresses ) but people use names as they are much easier to remember. When you type in a domain name into your web browser the name is translated into an IP address by a DNS server usually located on the Internet. TCP vs UDP – What is the Difference? Thanks for the nice article. But for me there is one glaring omission: what year was it published? 1999? 2009? 2019? Sorry, but this is a pet peeve of mine, knowing how up-to-date information is likely to be before I invest time in reading an article. I know I can look at dates on the comments, but maybe nobody commented until 20 years after it was written. are the, they are: … What??? Tks for pointing that out. I had to read it several times to understand what it meant. It refers to the TCP/IP model being the most important one to understand. I’ve edited the text so it makes sense now.